The group helped us to sort the many boxes of toiletries that we had collected over the last 2 months. Sorting them in bags of shampoo, conditioner, soap etc and labeling the bags in Chinese all takes valuable time and so we really appreciate the extra willing hands. The toiletries are now boxed and ready to send on the next truck going to a poor area of China. The majority of the toiletries are things donors have picked up from hotels or airlines and are marked in English – so it is important that they are sorted and marked in Chinese before we sent them out to areas where people may have never come across hair conditioner ( for example ) before. 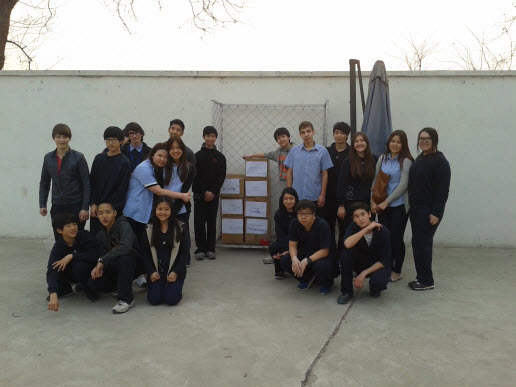 Thank you Beijing New Talent students for your help in making a difference. We enjoyed having your here.and hope you return again soon. Next : Astounding Book Fair Success at The British School.